Succulents might be the easiest, peasiest plant to regenerate. Most of them are indeed tiny in size. Still, they are pretty badass when it comes to reproducing. There is something magical about these plants that makes them so unique. The way a single plant can be turned into multiple plants is simply amazing. Yes, you only need one pot of succulent and it will give you hundreds of baby succulents. Indeed, you can grow a collection of these hardy plants through propagation. 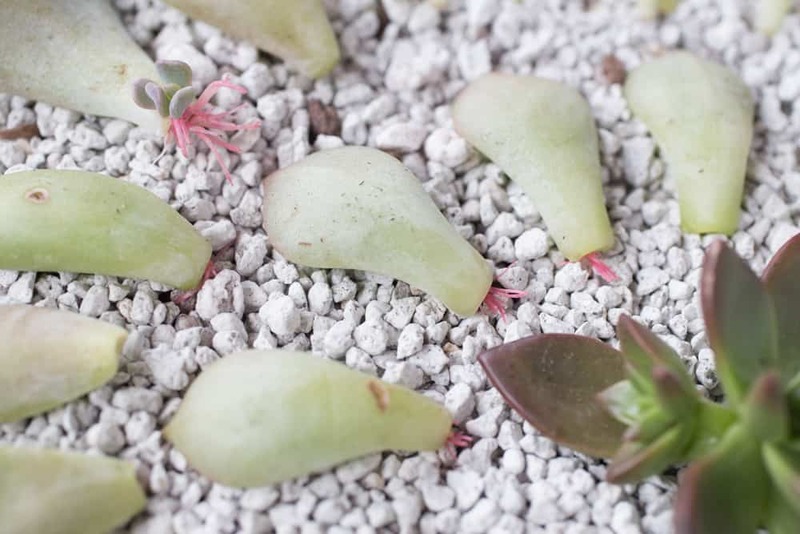 Propagating succulents allows the plants to clone into newer plants. This treatment can also help maintain the succulents’ overall health. There are several ways to propagate these hardy plants. Types of propagation available are through the succulents’ leaves, stems, or by dividing the succulents into newer plants. 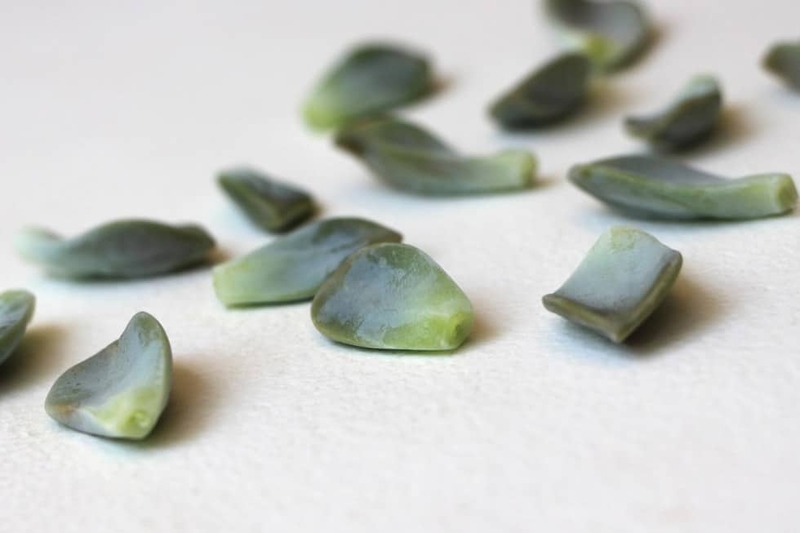 Next time you accidentally snap a leaf of your succulent, do not throw them away! If the leaf is cut near its base and have such a nice cutting, the apparently hopeless leaf can grow into a new plant. This process of growing an entirely new plant out of a single succulent through its leaves is called succulent leaf propagation. Succulents are capable of surviving even in an extremely rough climate. It has been the plants’ extraordinary ability to root and grow by using most parts of its body, including its leaves. You can plug leaves of your old succulent and simply tuck it into the soil, and there will be a collection of new succulents. It might seem easy to propagate such a plant. However, this process should follow certain treatments and steps in order to successfully produce new plants out of the leaves. Not all types of succulents can be propagated form their leaves. Some succulent varieties perfect for this method include echeveria, graptopetalum and sedum. Why these three, though? The reasons are actually related to the varieties’ ability to response to rough environment stress. These varieties are especially rich in meristem cells in its junctions between the leaves and the stems. These cells are responsible for the roots to develop. So, how to propagate succulent from leaves really? There is nothing hard about it. All you need is pulling off some leaves pretty close to their base. It is critical to have the leaves come off fairly close to the base in order to have the maximum amount of meristem cells. Feel strong with the leaves, next is leaving them to dry without any direct sun. Place them on a bed of dry succulent soil and wait until new roots are forming. After a few weeks of waiting, you’ll see several clusters of small leaves growing. Don’t bother to water them, as too much water will lead to over moisture and rotting. Over time, you will notice the old leaves start to wither, following the growth of the baby plantlet that relies mostly on the old leaf’s nutrient and moisture. When you see several roots emerging, then they are ready to be planted. Lay the new baby plantlets, leaves side up, on pots or containers with dry succulent soil. Wet the plants by regularly misting the soil every few days. Put them in a semi shaded area for about 4 weeks. Besides propagating succulents from leaves, you can also propagate them through stem cuttings. Almost all types of succulents can be propagated through their stems. In fact, stem propagation can be performed to almost all kinds of plants. Different from leaves propagation, this method uses succulent cuttings to reproduce new plants. 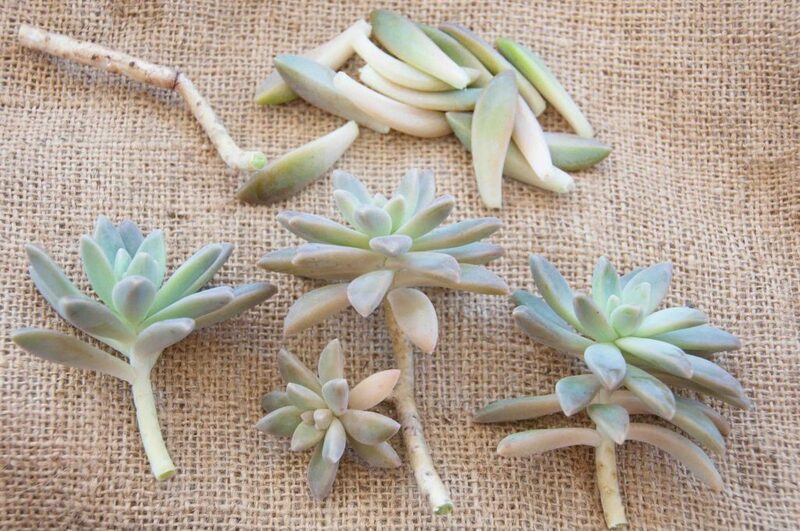 Stem cuttings propagation is possible because of the existence of meristem tissue in succulents’ stem. Some best varieties that work well with stem cutting include aenioum kiwi, portulacaria afra, and many others. Propagating succulents through stem cuttings method is as practical as the one with leaves. Prepare all the things you need, and you are already half way to the finish line. Let’s begin this how to propagate succulents through stem cuttings by introducing the tools and other things you need. Prepare a succulent plant of your choice, a sharp pruner, succulent soil, and containers. The first thing you need to do is examining your succulent. Try to propagate a succulent that has an intact, healthy leaf. You can basically go for any stem you like. However, a 2-4 inches stem that is long enough for at least 2 sets of nodes for rooting and leave growing will likely give you the fastest rooting process. Once you find a potential stem, cut the stem using a sharp pruner. Avoiding dull pruner is important as the cutting can be prone to infections if it doesn’t have such clean cut. Next thing you need to do is setting up the nodes for rooting. Pluck some leaves near the end cut to expose the nodes. Depending on how long your stem cutting is, removing at least 2 leaves for nodes while keeping some leaves attached to the stem are keys to planting succulents successfully. While the nodes are the rooting points, the intake leaves are the moisture and nutrients provider for the new plant. Succulents develop a strong sense of up and down. Hence, it is important to orient the succulent cuttings to the right up and down direction. Set your cuttings to sit on a bed of fast draining succulent soil and allow them to callous over for a few days. Put them in a shaded area to retain their moisture. Once the roots are developed, you are ready to put them in new pots. Repotting succulents should consider not overcrowding the pot. Hence, be mindful with the quantity of the plants you are about to plant. Insert some root ends in the pot of dry succulent oil and place them off the direct sunlight. From this point, start to mist the new plants once per week. Beside propagating succulents from leaves and stem cuttings, you can also propagate through divisions. This may be the easiest succulent propagation to do. Instead of training the meristem cells to produce a root, dividing succulent literally mean dividing the plant. This means, do not fully rely on open cuts for rooting; only divide the roots and the body to be replanted. The plants that already developed other bodies from the same root space in the same containers. Considering the three conditions some famous names such as Senecio serpens ‘Blue Chalksticks’, Sedum clavatum, many varieties of crassula, kalanchoe, and sampervivum are suitable for divisions. Often claimed as the easiest method of propagation, propagating succulent through divisions needs extra gentle treatment. You don’t need to wound the succulents using pruner or anything. All you need is your hands to separate the pups from the mother succulents gently. Repotting succulents to new containers and placing them in shaded areas for a few days. Mist them every once in a week and enjoy your new pots of cute succulents.